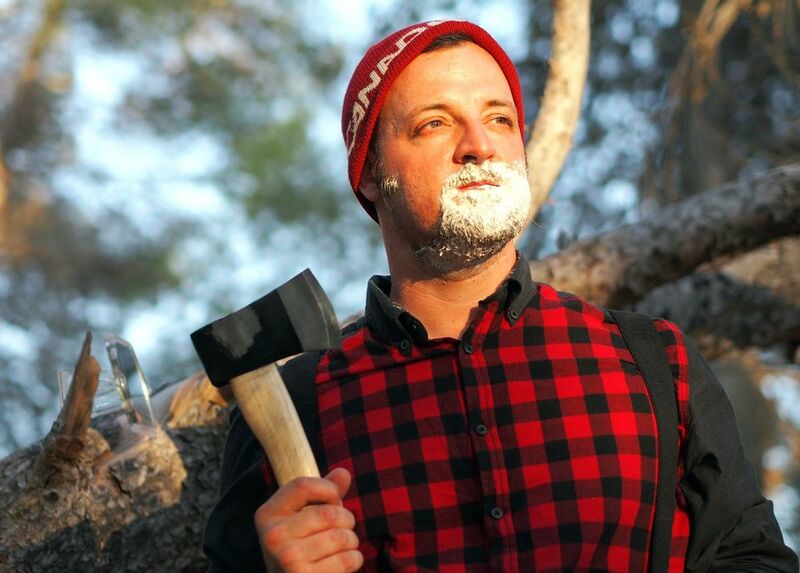 We’ve all seen art showing brawny, bearded lumberjacks giving themselves a shave with their axe. 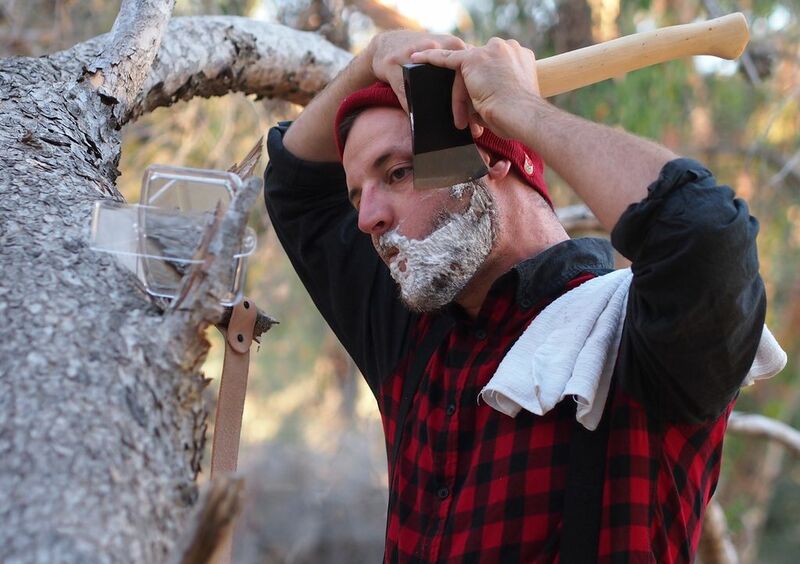 The reality is that using an axe or hatchet for shaving is not only possible, but a preferred option if you’re stuck without a razor. 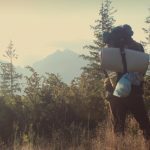 Let’s take a look at some important things to consider so that you can safely use your handy tools as a razor blade in the field. 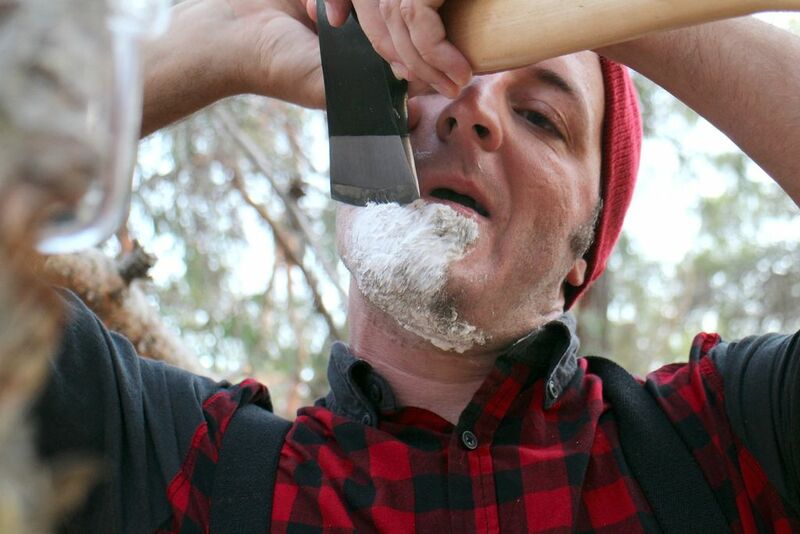 As a disclaimer, we are not recommending that you actually try to shave your face with an axe or hatchet. In fact, the depiction mentioned above probably stemmed from a period in the early 20th century when axe salesmen would shave their faces as a way to demonstrate the quality of their products. 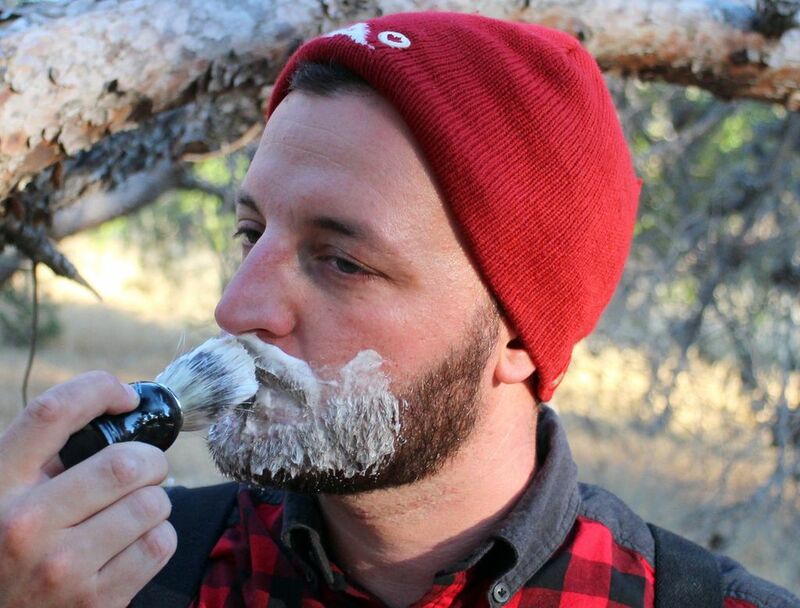 While it is completely possible to shave with an axe, only you can decide if it is worth the risk. You can use your imagination to see how using an axe can go horribly wrong if you’re not careful. 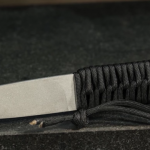 Using a survival knife on the other hand is a more reasonable alternative due to its smaller size and lack of heft. Razors are incredibly sharp and thin, which is necessary to cut through coarse hair while producing a smooth shave at the same time. 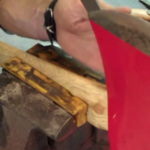 Unfortunately, the blades on axes are wider and angled to split wood. In order for you to use an axe, you will need to grind the blade from the standard 30-40 degree angle to a razor-sharp 10-15 degrees. This requires a grinding machine with appropriate grinding wheel along with a good blade angle gauge. You can also find jigs that are specifically designed for sharpening axes on grinding wheels to make the process easier and more precise. 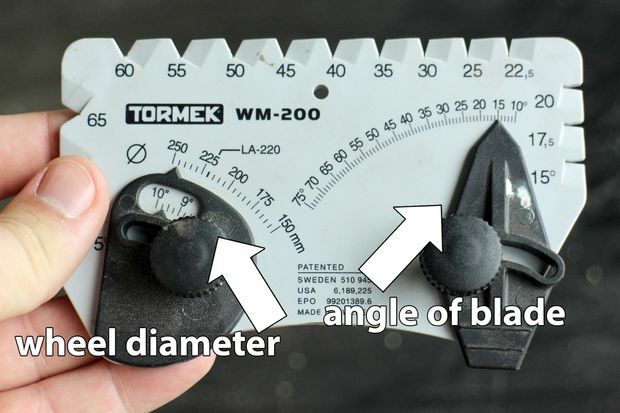 The blade must be nearly-perfect in angle, uniformity and free from dents or dings. While you can eyeball this without using the methods above, it’s highly-recommended that you use the machine at least a few times before trying to improvise to produce similar results. Otherwise, you run the risk of gouging your face as you shave. 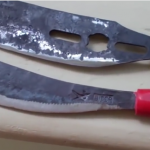 Now that the blade is razor-sharp, you want to minimize injury by holding the axe properly. Place your dominant hand around the handle of the axe while your fingers are cradled above the top of the blade. Re-position your fingers between the blade and handle as necessary as you are shaving. Make sure that you have a firm and steady grip, and also make sure that you can use your hand to guide the blade around the contours of your face without difficulty. Start by lathering your face with some good old fashioned cream and shaving brush to tenderize the skin. Place the axe above your cheek and work your way down as you would with a straight razor. Make sure that you wipe the blade clean after every stroke. You don’t want to use the entire blade to shave. Rather, angle the axe so that the leading edge of the blade is slowly being used to etch away at small sections of beard at a time. After a few passes, your blade will get nicked and start to dull. You will need to hone it by running it along a leather strap to remove the imperfections in order to avoid getting cut. 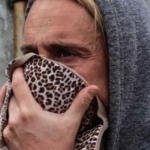 Be prepared to do this after each cheek as a general rule of thumb. You will notice when the blade starts to dull as with a traditional razor: It takes more strokes to cut through the whiskers. Don’t delay honing, even if it takes extra time. The last thing you need is to get cut as you are gingerly maneuvering the heavy tool across your face. Shave in a downward motion for all of the parts of the face and neck. This will minimize the potential for injury. You also want to hold the skin tight with your free hand as you shave as well. Don’t expect to get a close shave that will leave your face with baby-soft skin. However, you can get rid of a beard and give yourself a clean and groomed appearance by carefully using a very sharp and honed axe. Finally, expect to get cut as you shave, especially as you work around the contours of your face. Try to avoid making additional passes over cut areas with your blade, otherwise the heft of the axe can make the cut worse. While this shouldn’t be your first choice when it comes to shaving, it is a viable option to consider in a pinch. Just remember the secret to a good and safe shave lies in the sharpness and angle of the blade, keeping it honed and maintaining delicate control over the axe every step of the way.